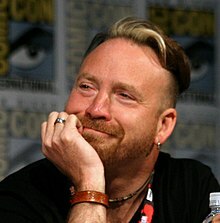 Trevor Jay Devall (born November 10, 1972) is a Canadian actor, voice artist, and comedian, known as the voice of Iron Will and additional voices in My Little Pony: Friendship Is Magic. He also voiced Shaw in Open Season: Scared Silly, filling in for Gary Sinise. Trevor was born Trevor Jay Devall in Edmonton, Alberta on November 10, 1972. He is the youngest of five siblings. He was into theatre and did tap, jazz and Polynesian dance as a child. He attended the University of Alberta for drama and directed stage productions, as well as student movies. Trevor moved to Vancouver in 1998 to pursue a movie directing career. While working for a talent agency, he made a demo tape for them and began landing work as a voice actor. In March 2015, it was announced Devall would be the voice of Rocket Raccoon in Marvel's animated Guardians of the Galaxy. Since 2007, Devall produced his own podcast, Voiceprint with Trevor Devall & Guests, where he interviewed fellow Vancouver-based voice actors and answered questions from fans. Each episode featured a different voice actor as the episode guest, though some episodes featured other people in the voice-acting business that may not actually be voice actors themselves; or behind-the-scenes looks at the life of a voice actor. Topics usually included how the guest made it into the voice-acting business, what it is like working in the industry, and the general lifestyle of a voice actor. The series concluded its first season after 36 episodes in December 2013. The second season was announced in the final episode of season 1, as Trevor moves to Los Angeles, California to continue his career and the show. 13 Behind the Toronto Con A day in the life of a voice actor at a convention. 29 Voltron Force! From Koko Productions Studio during the recording of the final episode of the new Voltron. ↑ 1.0 1.1 1.2 "BA #028: Trevor Devall". Box Angeles podcast. ↑ "Marvel's Animated 'Guardians of the Galaxy' Finds Its Rocket Raccoon". The Hollywood Reporter. This page was last changed on 1 December 2018, at 19:05.